Today some beautiful bathrooms. I’m loving the gorgeous mirror in the image above. 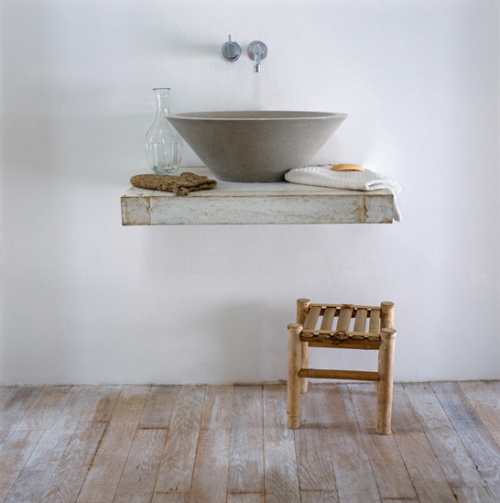 All these bathroom have a sink made from stone or concrete, which combines beautifully with wood. The first image comes from this beautiful, beautiful house that I have had the pleasure of staying in, as well as the owners’ little “cabanon”. It’s one of our favourite holiday homes , set in vineyards and an olive grove in the Luberon in the South of France. I have written about it several times on my blog, as well as the owner’s gorgeous flat in Marseille. wow! how beautiful…and fresh! love it! but where is the drain ?? 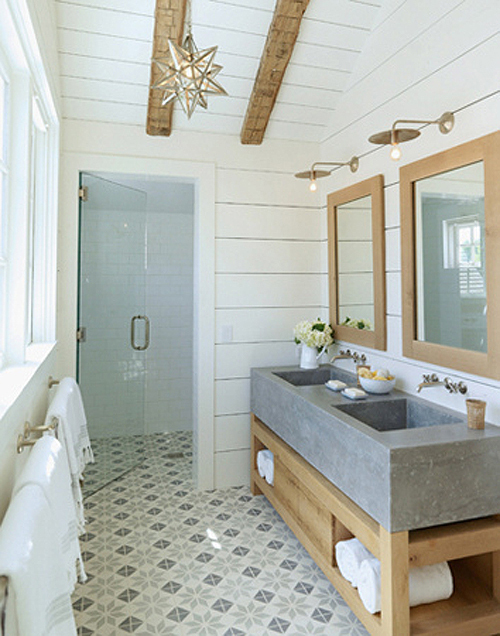 I too love that gorgeous mirror and how it plays so well with the concrete countertop, it’s fabulous, you feel regal checking your reflection in that, and the tile in the third shot is killer, the whole bathroom is, but I can’t stop staring at the tile – love it! The first picture is of one of the bathrooms in this house in the Luberon, France. I’ve had the immense pleasure of staying in it and the owner’s other adjacent “cabanon”. It’s one of our favourite holiday homes, on a huge property set amongst olive trees and vineyards. Everything is perfect! I’ve written about the cabanon a couple of times on my blog. I can give you the address if you are interested. Very beautiful (and unique) indeed! All I can say is WOW, so simple yet beautiful. Maybe I should build my own with concrete? Very beautiful together with the white of the walls, gives it an airy and light touch. 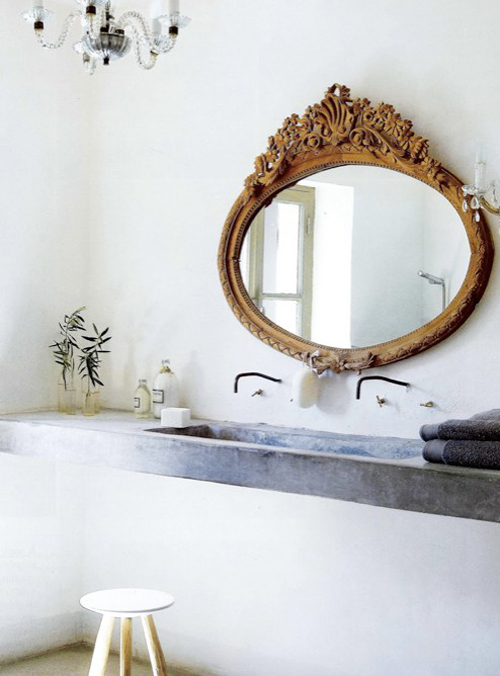 I love the contrast of the gilded mirror with the stark bathroom. It’s very nice. Absolutely beautiful! Exactly what I would love for a bathroom! That last image is so beautiful! I love how it seems to bring the outside in! Any ideas as to where I could get tiles like the ones in the third bathroom photo? I live in France. Hi, would like the price of the Nantucket model sink. If I’m correct that’s the freestanding sink in the second photo. How long would it take from ordering it to receiving it. It’s beautiful. Where’s the plubming?! Love the 2nd photo. thanks! ops! I wanted to write where’s the plumbing! Those are beautiful bathrooms indeed. Simple and minimalistic designs. Nice touch !! !